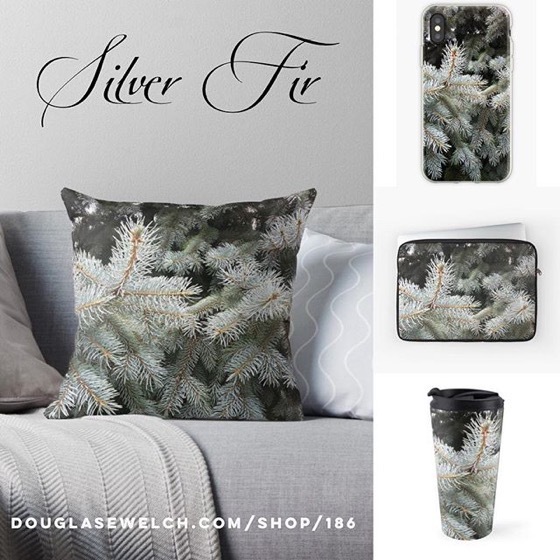 Christmas Cards, postcards and a cloth tote bag all featuring a photo by yours truly. 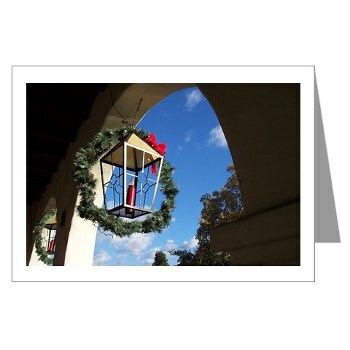 I took this photo several years ago on a beautiful December Day in Ojai, California. Today is a slow day for cookie baking. I forgot to pull my supply of butter out of the refrigerator, so I was only able to make one batch. I think it is a really neat one, though. I came across this new recipe on the Picky Palate blog. 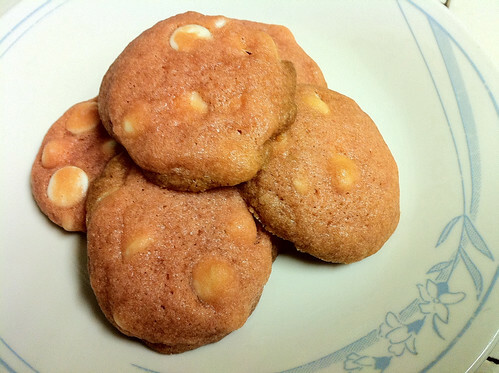 Their pink color, caused by the inclusion of Strawberry Quik in the recipe intrigued me immediately. I love to make things that cause me recall my childhood and this seemed perfect. I added a bit of red food coloring to the batter to increase the “pinkness” although it is a bit difficult to see it in the photo. You can add more or leave it out entirely depending on your own personal preference. The inclusion of white chocolate morsels gives a strawberries and cream vibe and I love the way they came out. Holiday Cookie Baking Day #1: Oh, Fudge! 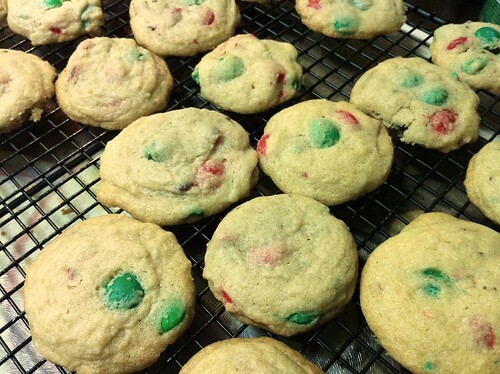 Holiday Cookie Baking Day #2: M&M Good! I was home all day with a sick boy but I didn’t get any baking done. 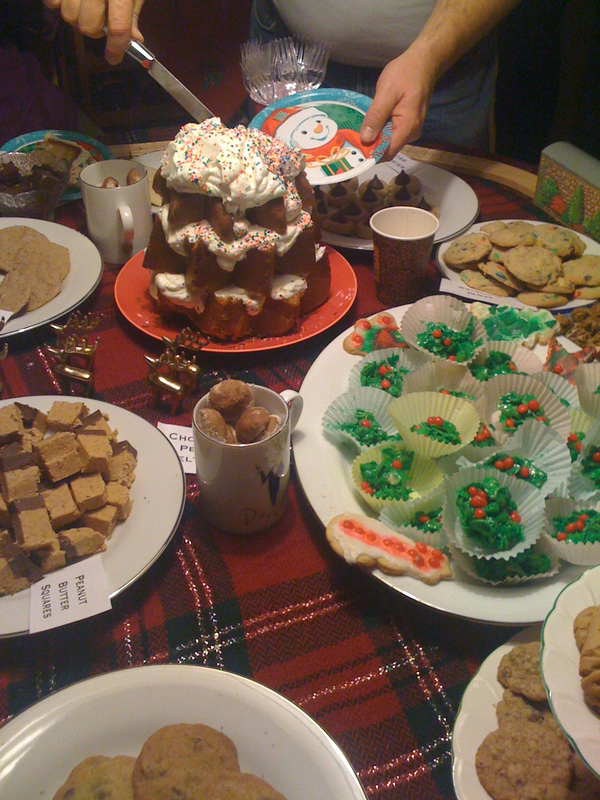 Other duties held my attention until after dinner, but even then I made up 2 batches of cookies — 5 dozen of each. 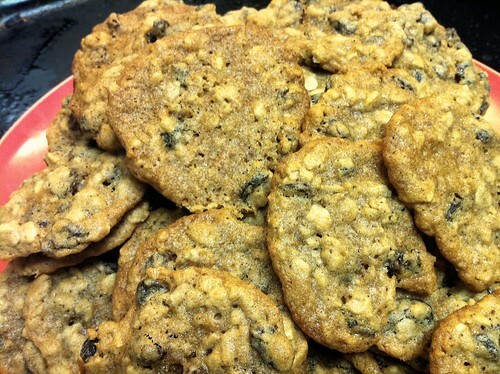 The first cookie was a traditional Oatmeal-raisin. I am not a big fan (I prefer chocolate chips in my oatmeal cookies) but we have lots of friends and family who like them, including my wife. I think it gives them an extra special taste. The second cookie tonight was a traditional M&M cookie. Since the introduction of the M&M Mini’s most recipes have called for their use. While the size is better suited to cookies, Minis don’t have the same taste as regular M&M’s. This is exactly why I use the big M&M’s when I make these cookies. They taste pretty close to what I remember growing up. Holiday Cookie Baking Day #6: Lemon Biscuits from Green Gables, Pecan Puffs and more! Today I started baking for our annual cookie party, where I make 80-100 dozen cookies and treats for an all-day Open House. After a quick trip to the grocery to pick up final supplies and a short detour of time dedicated to putting up the outside Christmas Lights, it was time to begin. In the past, I really only made one fudge each year. My Baker’s Chocolate-Walnut fudge comes from the inside of the Baker’s Chocolate box available in most markets. I know, I know, I am giving away all my non-secrets, but it is a decent fudge that everyone seems to like. A few years ago I added another easy, microwave fudge from Alton Brown’s Good Eats series. Microwave Peanut Butter Fudge couldn’t be easier and it also tastes very close to the fudge I remember when I was growing up. Finally, this year, I have added another fudge to the mix, Microwave Raspberry Fudge. This is a chocolate fudge base, very similar to the Baker’s recipe but then a second layer of fudge made from white chocolate, cream and raspberry jam is added on top. This one is so good I can easily see making it every year…and maybe at other times of the year, just for fun! You can find complete recipes for all these fudges by clicking on their names above. Throughout the year I have been reading many food blogs and using Google Reader to highlight and share my favorites both on Google Reader and via my Twitter and Facebook feeds. If you would like to monitor my interesting recipes, use this link — Douglas E. Welch’s Shared Recipes. 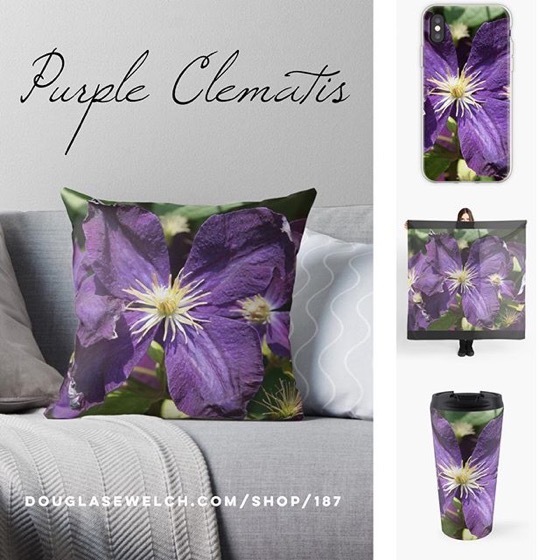 If you would like to follow all my shared items, including recipes, gardening, new media, technology and more, you can use this link — Douglas E. Welch’s Shared Items. Peanut Butter Candy Cups – November 23, 2010 – These could either be insanely great or a too-sweet mess. MIght be worth trying though. Chocolate Stout Cake and Cable TV – November 23, 2010 – Stout beer, chocolate in one cake…ok…bread pudding actually. Definitely worth a try. As the World Churns – November 23, 2010 – Something sweet and new to check out in the neighborhood. Homeland Security Watch » “Do I have the right to refuse this search?” – November 21, 2010 – A detailed and considered analysis written long before the current “enhanced” procedures. Lots of good comments, too. Gmail Call Recording Appears To Be Rolling Out Widely – November 20, 2010 – Could be useful in recording podcast interviews, etc. Cheese & Rosemary Shortbread Crackers – November 18, 2010 – Something savory to balance out all the cookies I think! Joelen's Culinary Adventures: Spiced Pumpkin Fudge – November 18, 2010 – Sounds like something I might try for this year’s cookie party. I love all sorts of sweet pumpkin treats. Did you go to the Metro Show? Cranberry Sangria – November 17, 2010 – Sounds like a refreshing version of sangria just right for the holidays. Punches are always good for parties as they don’t require your attention once they are assembled. I would love to do a custom cocktail for our party, but don’t relish standing behind the bar mixing drinks all night. Editing your Google Docs on the go – November 17, 2010 – A great extension to the already great Google Docs. I use Google Docs more than I use MS Word or any other word processing program these days. For most people it is a more than acceptable replacement. As anyone who knows me can tell you, I am a geek in all things. One of my “other” geekdoms is architecture. I tend to read a lot about it and also seek out great examples such as the Frank Lloyd Wright and Richard Neutra homes we have right here in LA. Sarah Susanka’s series of books are about new thoughts in architecture. Instead of building everything bigger, like the numerous “McMansions” also here in LA, she consuls you to build smarter. Instead of building huge homes were rooms regularly go unused, Susanka calls for smaller homes designed for the way we actually live. The savings generated by small square foot houses are turned back into amazing design details that make the home more livable and flexible. Here is an inexpensive gift for the commuters in your life. We recently picked up 3 tumblers like this at a local store. 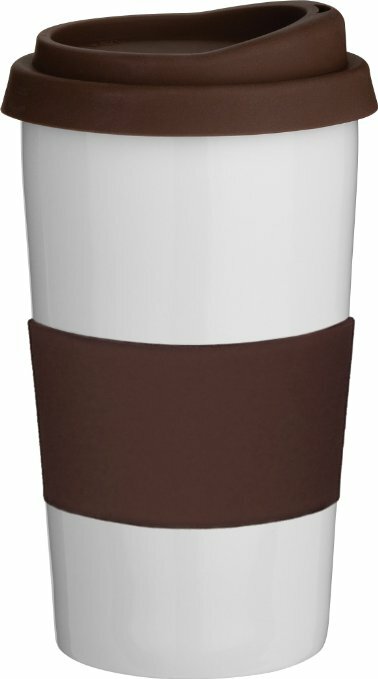 I drink a lot of coffee and now this mug can be filled at home or at the local coffee shop. No more paper cups. It also keeps coffee warmer than paper. Get one for yourself and one for your friend! I received some of these as a gift many years ago and they are used throughout the year, but especially in the run-up to my annual Cookie Party. Each year I make between 80 and 100 dozen cookies and candies to serve at this all-day open house. There are all size for these pads, depending on your needs. Today’s LA Times Editorial page carries this article, “Shut up and be scanned“. When someone in power, such as the editors of a major metropolitan paper, respond to the current TSA policy outrage with “Shut up and be scanned”, it is a clear indication that we should, and need, to do exactly the opposite. It is a red flag of the highest level. “Shut up and sit down” is the answer used by those in power when they can offer no defense for their actions. They only want the problem to disappear instead of addressing the issue. I expect better from the LA Times than being told to “Shut up and be scanned”. I expect considered discussion about an issue, not paternalistic claptrap. 4 Years ago at BarCampLA: Good Times!